Packing Tapes- Campbell International Specialist Tapes. Campbell International vinyl packing tape is strong and durable, it makes little noise when dispensed, making it a pleasure to use. 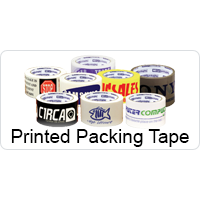 We recommend Clear Vinyl PVC/Vinyl Packing Tape. For those on a tighter budget, polypropylene/PP packing tape makes an excellent alternative. To promote your organisation, we offer a wide range of high-quality custom printed packing tapes. Dimensions: 12mm x 66m Technical Specification: Sellotape Original Golden tape is extra strong and sticky / Ideal for everyday sticking tasks, including wrapping presents, sticking paper and all sorts of household objects. 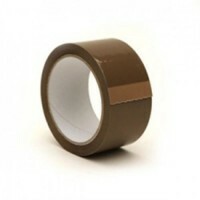 The adhesive tape is golden in colour, but clear when applied / Anti-tan..
Dimensions: 25mm x 66m Technical Specification: Sellotape Original Golden tape is extra strong and sticky / Ideal for everyday sticking tasks, including wrapping presents, sticking paper and all sorts of household objects. The adhesive tape is golden in colour, but clear when applied / Anti-tangle a.. Size: 48mm x 50m (2" x 54 Yds) Description: Brown Paper Packing Tape Box of 24.. Size: 50mm x 66m Description: Red printed on white 25-micron polypropylene (PP) packing tape.Quantity: 72 rolls (1 box) .. Size: 48mm x 66m Description: Red printed on white 25-micron polypropylene (PP) packing tape. .. Size: 50mm x 66m Description: Handle with care printed in red on white polyvinyl chloride (PVC) packing tape ..
Technical Specification: Premium vinyl (PVC) packing tape printed 'Manufactured in Great Britain' with the union jack symbol.Size: 50mm x 66mThickness: 35micron..
Colour: Buff/Brown. Dimensions: 48mm x 66m (2" x 72 Yrds). Quantity: Box of 36. Technical Specification: Buffpackaging tape with an aggressive solvent adhesive suitable for use in freezer and cold store conditions, the tape peels easily off the roll and is quick to apply when using a tape disp..
Colour: Clear/Transparent. Dimensions: 48mm x 66m (2" x 72 Yrds). Quantity: Box of 36. Technical Specification: Clear packaging tape with an aggressive solvent adhesive suitable for use in freezer and cold store conditions, the tape peels easily off the roll and is quick to apply when using a ..
Colour: Buff/Brown. Dimensions: 48mm x 132m (2" x 144 Yrds). Quantity: Box of 72. Technical Specification: Buff packaging tape with an aggressive hot melt adhesive, excellent for packaging. The tape peels easily off the roll and is quick to apply when using a tape dispenser. .. Size: 48mm x 66m (2" x 72 Yds) Thickness: 25 micronDescription: Buff packaging tape with an aggressive but low noise adhesive which peels easily off the roll and is quick and easy to apply when using a tape dispenser. .. Size: 48mm x 66m (2" x 72 Yds) Thickness: 25 micronDescription: Clear packaging tape with an aggressive but low noise adhesive which peels easily off the roll and is quick and easy to apply when using a tape dispenser. ..
Colour Choice: Black/Blue/Green/Lilac/Orange/Pink/Red/Yellow. Dimensions: 48mm x 66m (2" x 72 Yrds). Quantity: Box of 36. Technical Specification: Packaging tape with an aggressive hot melt adhesive which peels easily off the roll and is quick to apply when using a tape dispenser. .. Size: 50mm x 66mSpecification: Green print on white quality vinyl (PVC) tape. .. Size: 50mm x 66m Color: Red/White Description: Security damaged packaging caution message printed in red on white poly vinyl chloride (PVC) packing tape. Warns reciever of package to take note when signing for damaged packages. Print reads: SECURITY -- CAUTION! -- If ..
Dimensions: 48mm x 33m Colour: Black/Yellow Technical Specification: This is a thick, strong vinyl self adhesive hazard warning tape. Recommended for internal use only. ..